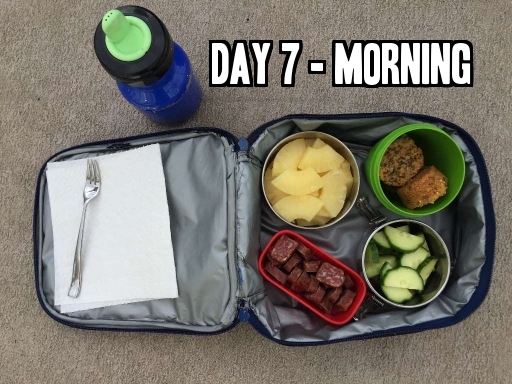 A few weeks ago I shared photos of school lunches I made for my 1st grade son. It seems that it resonated with a lot of you. 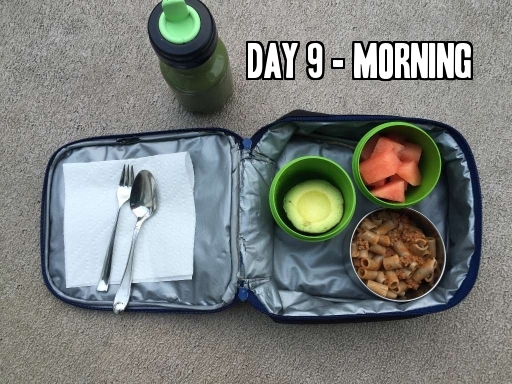 I hope you found it useful and that you had the chance to use some of those ideas into your children’s lunches. Please let me know if you did as I love hearing from you! 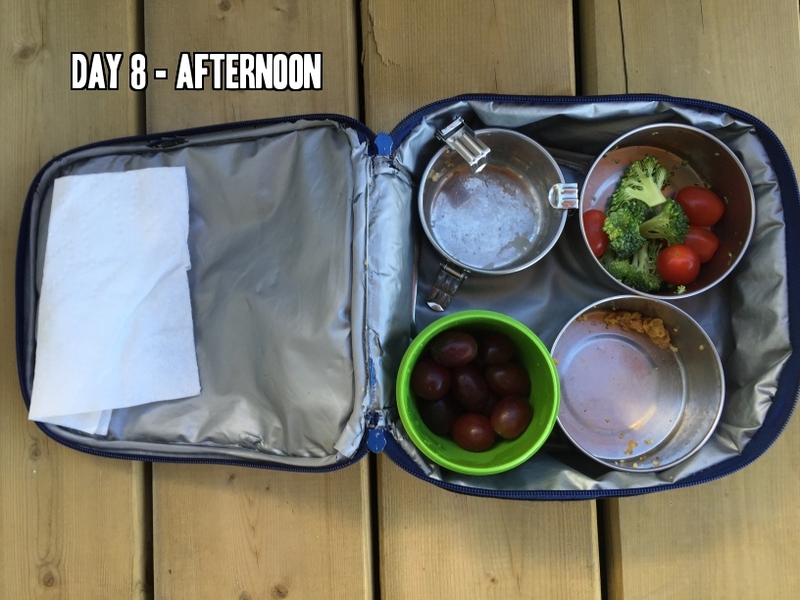 I decided to continue taking photos of my son’s school lunch for the following 5 days. 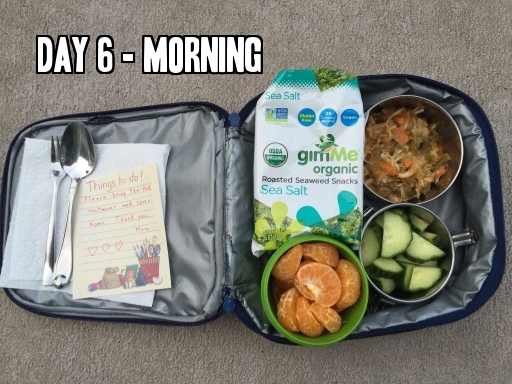 I hope these school lunches will give you new ideas on what to pack for your child at school. A bit of the green beans meal. Not bad! He also brought the red container home 🙂 . 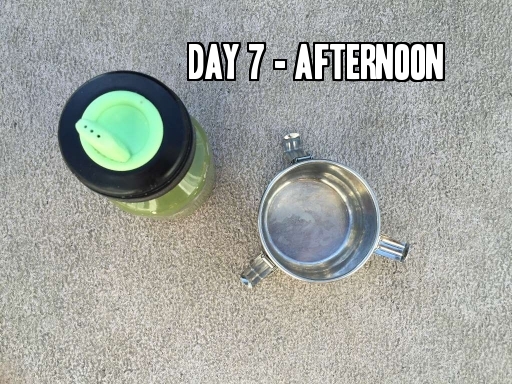 One food container and his water bottle. 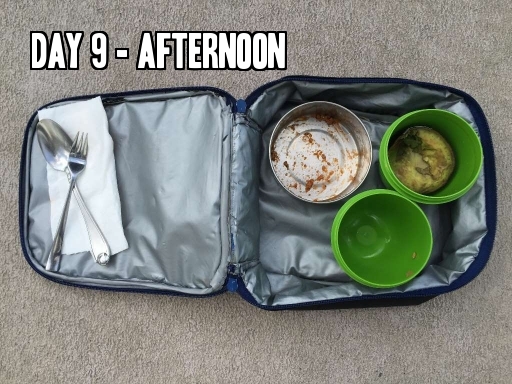 Yup, not only did he eat all the food, but he also ate the containers and the lunch bag :-). 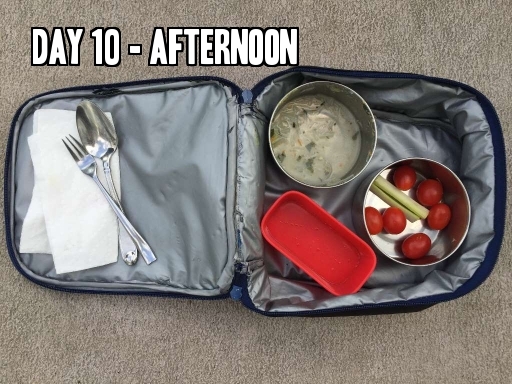 All joking aside, yes, as you probably guessed, he forgot his lunch bag and most of the containers at school. Funnily enough, prior this day, a friend of mine was telling me that I would be surprised what kids forget at school or at camp. She told me that jackets, water bottles, and food containers are among common things that kids forget. Sure enough, it did not take me long to experience this as my son forgot almost his entire lunch bag at school. 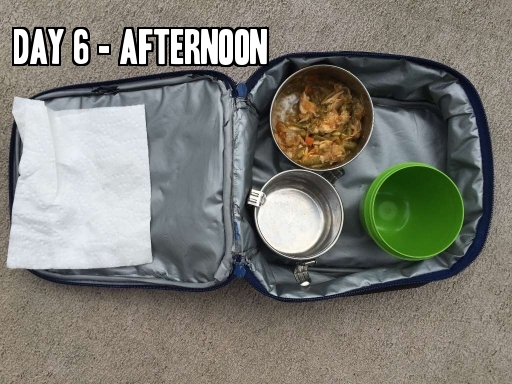 Somehow, a small food container and the water bottle found their lonely way into my son’s backpack. Me: Where is your lunch bag? Him (realizing what happened): Ay, I left it on my desk! Me (not believing this just happened, but surprised that he remembered where he left it): You left it on your desk?! Him: I am sorry mommy, I’ll get it back tomorrow. (OK, I thought, he apologized. It’s an honest mistake. I’ll let it go… Well, not really 🙂 ) . Me: Was there any food left? Him (thinking): I don’t think so…. Maybe some cucumbers …. Him: But I ate first the food that oxidizes quickly. The sausage. Me (in my head: Yup, those were exactly my thoughts too, my dear son. The food that oxidizes first is the sausage. I would have never thought otherwise. ): OK. Him (adding quickly, oblivious of my thoughts): I loved the pineapple! 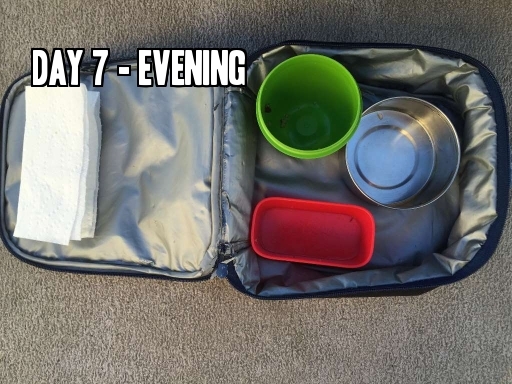 Luckily enough, my husband and I had a meet-the-teacher meeting that evening, so I recuperated the lunch bag in the evening and washed the containers. He ate everything. Happy dance! 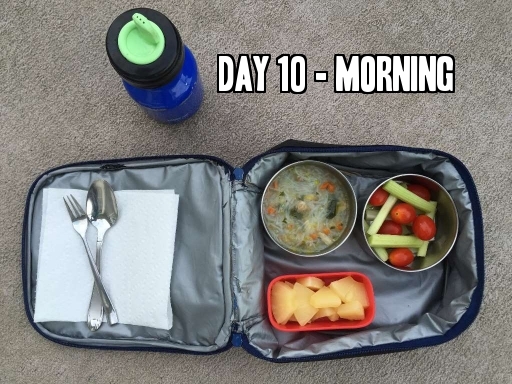 Last year, in kindergarten, I was not able to pack pineapple into my son’s lunch bag as he was sitting next to a little girl who could not tolerate seeing or smelling pineapple. This year, it seems that there are no issues with pineapple among the kids that sit next to him. A few grapes, broccoli, and cherry tomatoes. I forgot to mention that there was a Welcome Back Breakfast at his school that day (the school served breakfast to students and their parents). My son had breakfast at home and then he ate breakfast at school too. Because he had a double breakfast, I did not think he would be able to eat all his lunch. But he ate quite a bit. The avocado. He said it had a funny taste. It must have been the lemon juice I drowned it with. A few cherry tomatoes and 1 celery stick. Here’s what happened since the first 2 weeks of kindergarten. After having a few conversations with my son what what’s going on at snack and lunch time at school, I figured out what to do. I now give him only 3 foods choices in his lunch bag. One food for snack and two foods for lunch. He does not have time to eat more than that and it seems that I finally found the right amount of food to give him so he eats all or most of it. What about you? 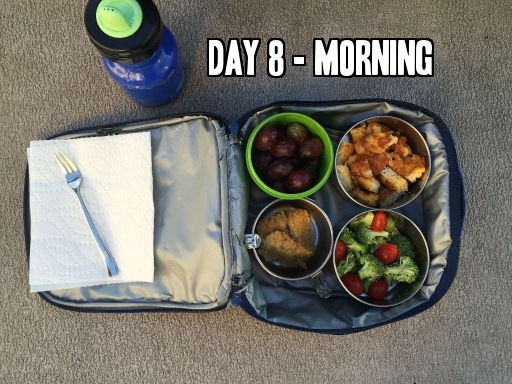 What do you struggle the most when it comes to packing lunches for your child? wow, this gives me so much idea what to send with my daughter.. thanks for this great post.. I am happy it is useful to you, Fareeha.